Aurident Provides the Highest Quality Porcelain Alloys and Casting Gold to Meet All the Needs of Today’s Dental Technician. 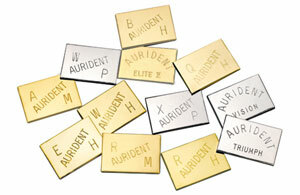 For OVER 42 years, Aurident has earned a reputation for excellence as a manufacturer of a complete line of quality dental alloys for dental laboratories and dentists worldwide. Aurident produces custom formulated dental alloys for porcelain fused to metal application, as well as quality gold and alternative alloys for all other dental applications. Only the highest available purity constituent elements and advanced state-of-the-art induction melting technology are used in manufacturing Aurident Alloys. Each batch is subject to stringent standards in Aurident’s quality control test laboratory, assuring customers of superb, consistent quality. ISO 13485:2003 certification membership and Identalloy®Council assures Aurident customers identifiable and consistent composition for every package of Aurident alloy. Dental Alloy Types: metal restorative alloys, casting alloys, noble metal alloys, palladium alloys, crown and bridge alloys, PFM alloys, gold alloys and ceramic alloys.